Apparently the striping is a fixed trait; the next bloom to open is identical. Excellent. 165-09-03: another approach to working with R. foliolosa. Click on the photo to view a larger version. A few days ago I mentioned 44-09-13, one of my Foliolosa/Therese Bugnet hybrids. 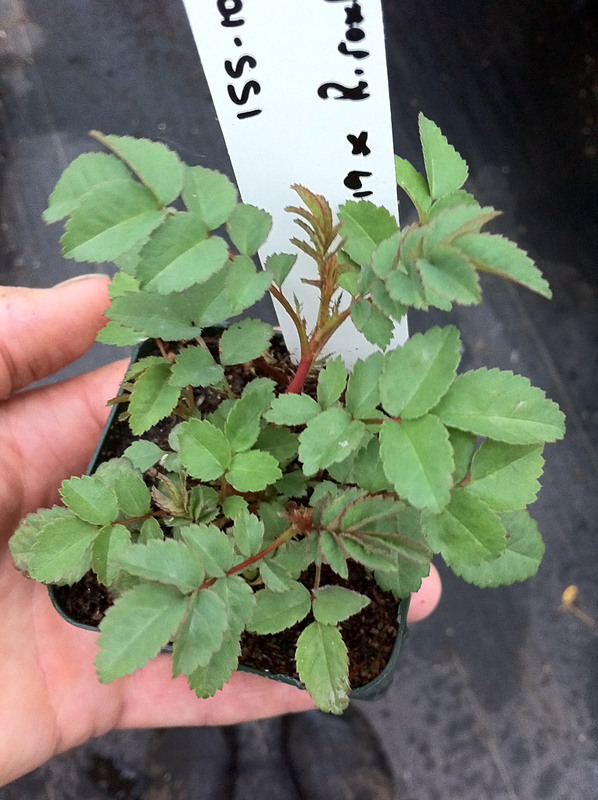 In the case of 44-09-13, the seed parent was a second generation R. foliolosa hybrid, whereas with today's seedling, 165-09-03, R. foliolosa itself plays that role. Both crosses utilize Therese Bugnet as the pollen donor. 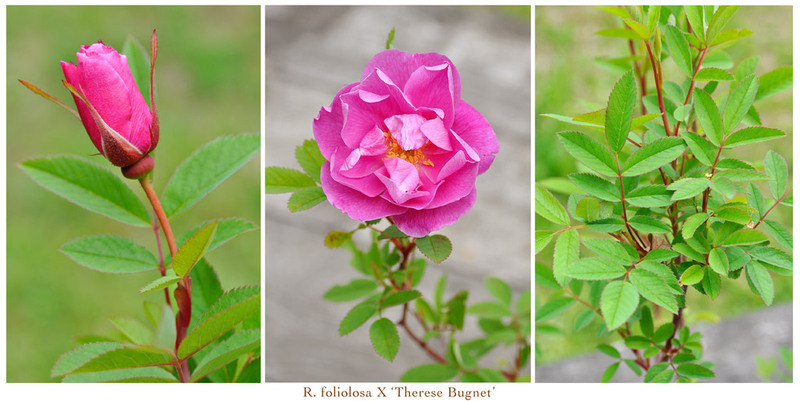 The idea was simply to make some Therese Bugnet crosses using any/all diploids I had on hand and which I knew to be decent seed bearers. The R. foliolosa approach was, to me, particularly appealing since it was such a healthy, Winter hardy individual. R. foliolosa also imparts on its progeny Fall foliage coloring to make the most dramatic of Maples and Sumacs envious; fiery oranges, yellows overlaid with flame red. 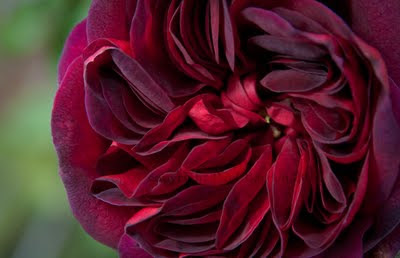 I have come to think that modern roses ought to have some degree of "four season appeal". I consider the seedling pictured here to be pretty much intermediate between its parents, although the flower itself leans more towards Therese Bugnet in size and petal count. 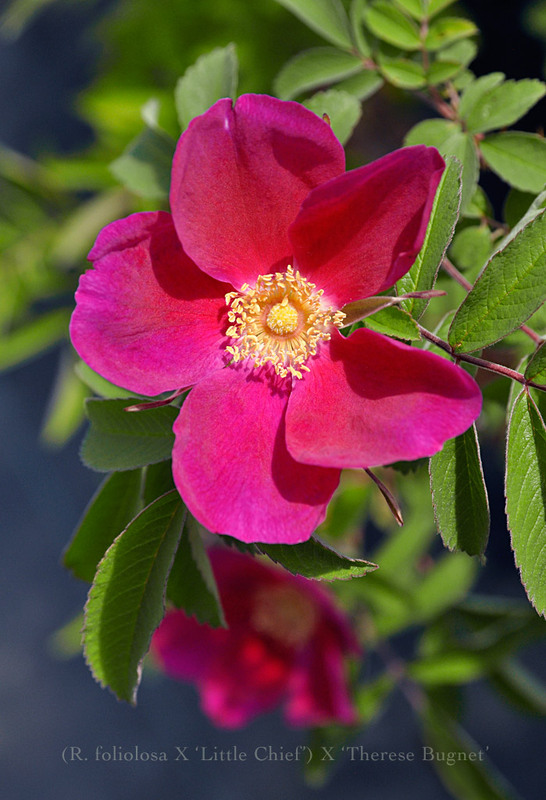 The bloom has a moderately intense Rugosa scent; a welcome trait, to be sure. 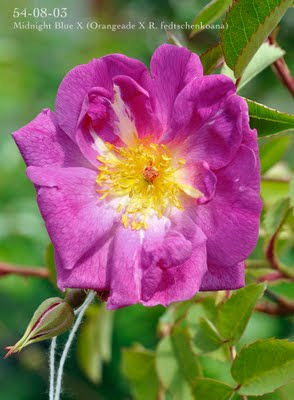 (The weather has been abysmally cold this Spring, so maybe when/if it warms up, the fragrance will be more intense.) The foliage could easily be said to resemble either parent, since both have fern-like feathery foliage that is narrow of leaflet and pleasantly matte in texture. Pollen has been collected from both this seedling and its relative, 44-09-13, to be tested for fertility this year. I will try to limit myself to working it on other diploids and maybe a triploid or two, but I might just dust a few blooms of Midnight Blue while I'm at it. I won't let the creation of triploids (and their potential for sterility) stop me from making a cross once I have a few foundation plants established in the confines of a given ploidy. As Ralph so often said, "The rose will find a way." This is the first of this group of seedlings to bloom. Hardly an exciting flower, really, but not a surprising result, really, considering how significant a role R. rugosa plays in its pedigree. 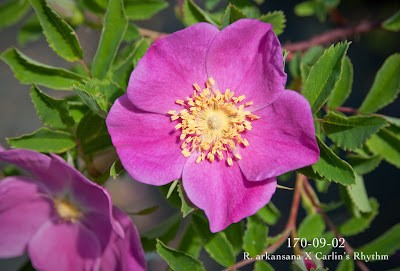 The fragrance, in fact, is pure Rugosa: richly Clove-like. The foliage is pure 'Therese Bugnet'; ferny, with narrow leaflets, and that odd matte texture. The foliage has been impermeable to the standard diseases so far, but testing in earnest for Blackspot won't happen till the selections are planted out in the open garden. For now, I am collecting pollen from some of these selections to test as breeders. I don't consider these individuals as "finished" works, but as potential stepping stones towards improved cold climate-friendly plants. You can view info about the seed parent here. 'Midnight Blue' is a truly amazing shrub. What color! 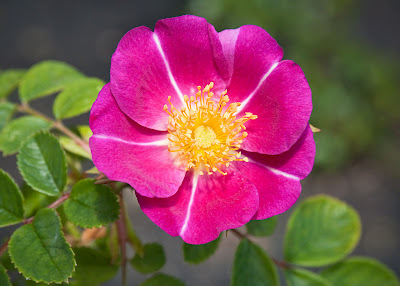 It is also a very willing and capable seed/pollen parent; it is one of the few roses I can expect consistently good numbers of fertile seeds from, regardless of what the pollen parent placed on it. Busy day, off to work! Proving fertility of the R. fedtschenkoana hybrids. A few years back, Kim Rupert graciously shared with me one of his experimental hybrids, 'Orangeade' X R. fedtschenkoana, a white flowered species-like hybrid designed to be used as a breeder plant. It took a while for my plant to settle into its invironment, but settle in it did! It is now a thicket (ever-spreading, I might add) about 8 feet across and 10 feet high. Contrary to expectations for such a cross, it does rebloom, although only modestly. Mine does not set seed, but offers potently fertile pollen. 54-08-03 was one of the first of about ten seedlings to bloom, and one of about four that I have selected for further breeding. Blooms are actually more lavender than they appear in photos. I recently germinated the first seedlings of crosses using this seedling, and some of its siblings. I don't know where this breeding line is going to end up taking me, but the R. fedtschenkoana genes are proving to be capable of imparting unique foliage, architecture and vigor traits to offspring. Seedlings also tend to hold on to the unusual "linseed oil" scent of the species parent. Not everyone is going to appreciate this fragrance, but I like its uniqueness. The foliage also tends to have a Pine-Cedar scent to it. 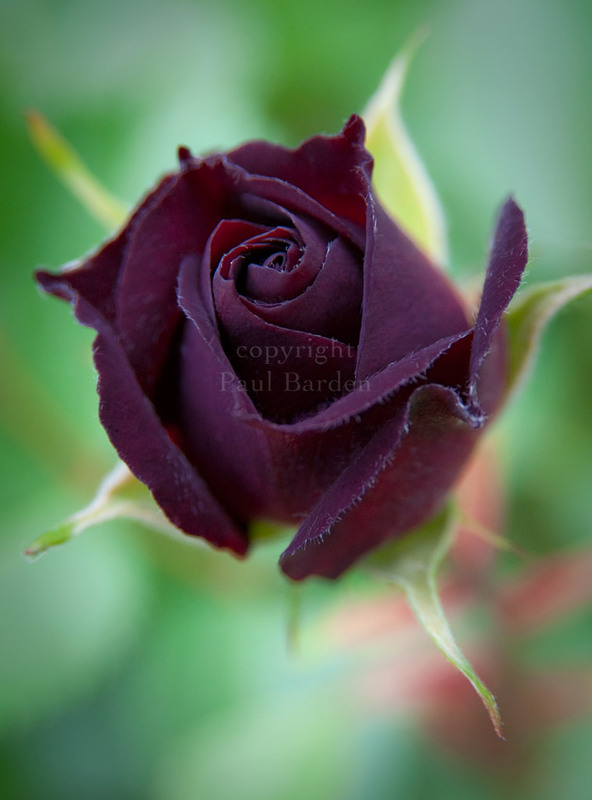 Busy day ahead; breeding has begun in earnest in the past 24 hours, as the main stud house explodes into bloom. I must go attend!